This Saturday, March 28th, a public memorial and celebration of Mike Hardin’s life will be held at Petco’s “Park in the Park”. 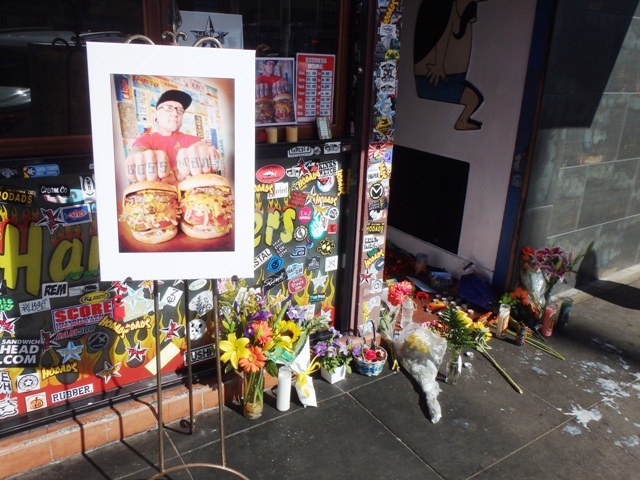 Hardin is mostly associated with his infamous Hodad’s OB burger joint. His eatery was showcased on national television foodie shows, such as the features on the popular TV show, “Diners, Drive-Ins and Dives” hosted by Guy Fieri. Hardin died of a heart attack in early February. The “Celebration of Life” event at Petco Park’s Park in the Park in downtown San Diego runs from 11:11 a.m. until 12:30 p.m. The memorial will include a special video tribute, musical performances and presentations from Hardin’s loved ones. Hardin and his folks started the original Hodad’s in 1973 right on the beach, literally – where the Saratoga Park grass stands today. (The media keeps getting this wrong. His parents had another restaurant in El Cajon earlier but was not called Hodad’s.) The family moved the business over to Voltaire Street. And when Mike’s dad passed, he took it over, fashioned a new, meatier burger – and was so successful with it, he and Theresa – his partner/co-worker – moved the enterprise over to its present location on Newport Avenue. Hardin and family opened up Hodad’s #2 on Broadway at 10th Avenue several years ago, also run a concession at Petco Park during the Padres season.